Uber pushed back against President Trump's immigration ban, after taking serious heat on social media for its initial response. CEO Travis Kalanick tweeted Sunday afternoon that Trump's travel ban from seven Muslim-majority countries "is against everything Uber stands for." He said the ban affects thousands of Uber drivers. Kalanick said Uber would compensate drivers for lost earnings if they're unable to work because of the ban. Uber also set up a $3 million legal defense fund for the "wrong and unjust" ban. Lastly, Kalanick said he would pressure the president to "stand up for what's right." The Uber CEO is an adviser on Trump's economic council. Uber's strong statement came after many customers lashed out against the company, saying it had responded inappropriately to Trump's Muslim ban. 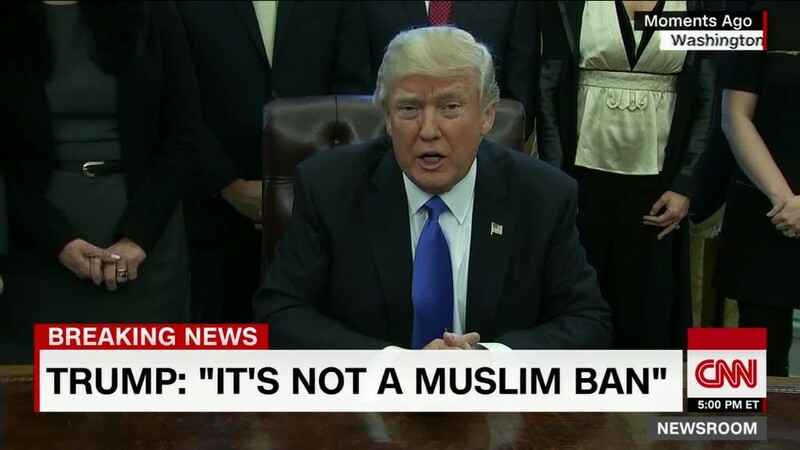 Trump issued a sweeping immigration order on Friday, banning travel from seven Muslim-majority countries. . By Saturday afternoon, protests had sprung up at airports around the country, where more than 100 visa holders were in limbo. In solidarity, the New York City Taxi Worker's Alliance called for a complete stop to pickups from 6 p.m. to 7 p.m. at JFK airport, where two Iraqis were being detained. At 7:30 p.m. Uber said that it was suspending surge pricing from JFK -- effectively lowering the cost of a ride. The backlash was swift. #DeleteUber started trending on Twitter, with people sharing photos of the "delete" screen on their phone and likening Uber's move to crossing the picket lines. Early Sunday morning, Uber tweeted an apology about and issued a statement. "We're sorry for any confusion about our earlier tweet -- it was not meant to break up any strike," the statement read. "We wanted people to know they could use Uber to get to and from JFK at normal prices, especially tonight." The company pointed to Kalanick's Facebook post Saturday, in which he said the company was working to identify drivers from the seven countries who could be impacted by the ban. But in his post, Kalanick also reiterated the importance of working with Trump, something he stressed to employees at an all hands meeting last week. Kalanick is a member of Trump's business advisory group, which will have its first meeting this Friday, he said. Meanwhile, Uber's biggest competitor, Lyft, took a decidedly different stance. The company emailed customers Sunday morning, condemning Trump's order. Lyft called the executive order "antithetical to both Lyft's and our nation's core values." Lyft also said it was donating $1 million to the ACLU over the next four years. Uber has come under fire before for its willingness to work with Trump's administration. On Inauguration Day, protesters stood in front of Uber's San Francisco office holding a sign that read: "Uber collaborates with Trump." "Whatever your view, please know that I've always believed in principled confrontation and just change; and have never shied away (maybe to my detriment) from fighting for what's right," Kalanick said in his post.